In Three Years of Logging My Inbox Count, I discovered that beneath my relationship with my inbox count lay dark, compulsive email habits. In this post, I will describe a few interventions that I’ve introduced to reclaim my attention. Checking email is a behaviour that has variable interval reinforcement. Sometimes, but not everytime, the behaviour produces a reward… Because you can never tell which time you check will produce the reward, checking all the time is reinforced, even if most of the time checking your email turns out to have been pointless. 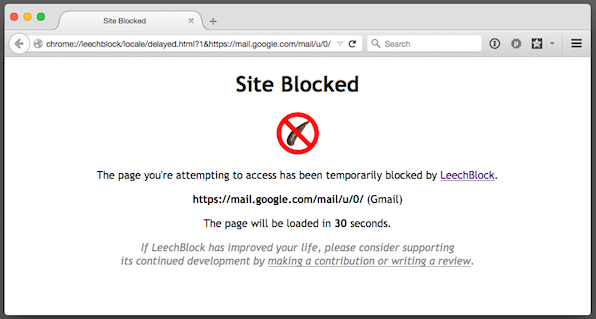 LeechBlock forcing me to reflect on what I'm doing with my life before I can access my email. 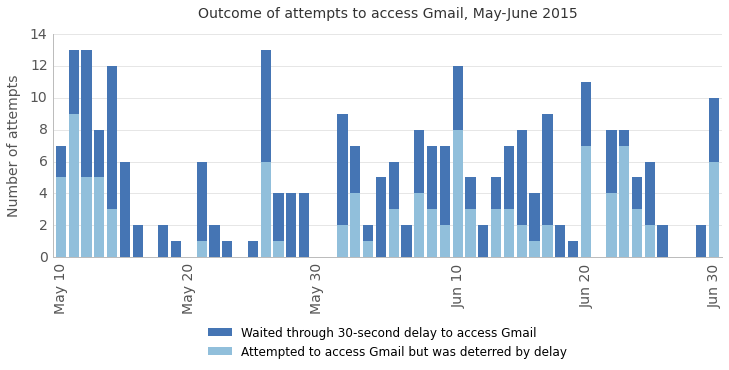 After an initial breaking-in period, I now attempt to access Gmail fewer than 8 times on most days, and I have achieved several days of relative mindfulness, on which I made only 1-2 deliberate visits to Gmail. Meanwhile, the thrashings of email addiction, which manifest as periodic tall spikes, betray a detox not yet complete. A few moments of forced self-awareness before checking email on my phone. 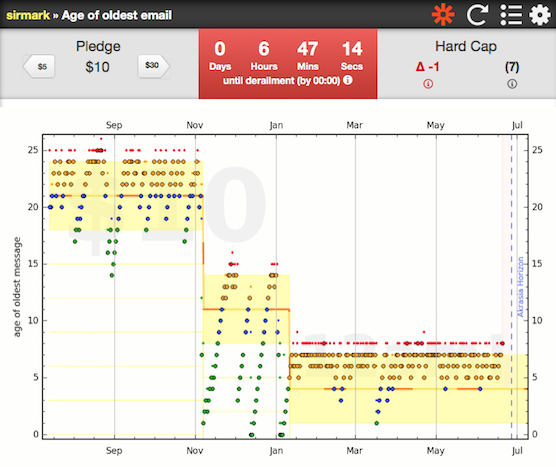 Automatic, guilt-free expiration of certain emails in my inbox. 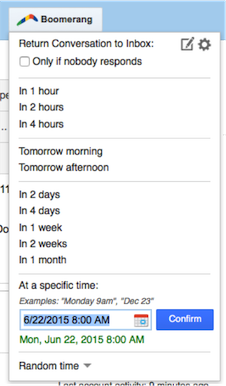 I wrote a Google Apps script which runs at the end of every day, moving each email one step forward towards expiration. If an email has reached label “x0” and is still in my inbox, it is automatically archived. On the one hand, this flow manufactures urgency to discourage me from procrastinating on making a decision about this kind of input. On the other hand, the disappearance means that it never piles up, absolving me of the stress I would otherwise feel when I do procrastinate. Find my script with setup instructions on GitHub. The reason for my habit of leaving things in my inbox is that it’s the only place where I trust I will revisit them. When I’ve tried GTD-style processing of my inbox into a to-do list, I eventually end up not checking the list often enough. As a result, the list actually becomes a graveyard. 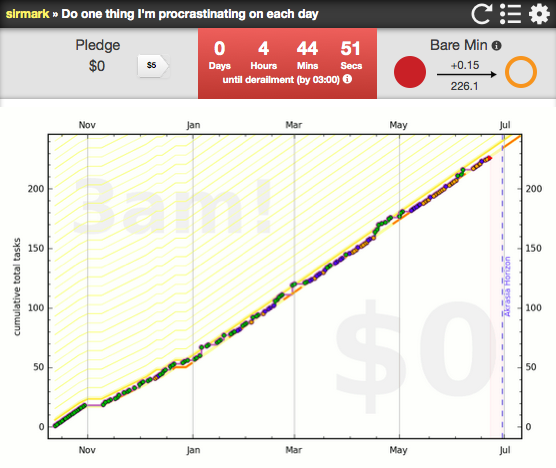 To counteract this, I have a Beeminder goal: “Do one thing I’m procrastinating on each day.” The size of the task is unimportant, but the fact that I’ve been putting the task off for at least a couple days is. Often enough, I need to check my to-do list to remember what I’ve been putting off. 8 months of "Do one thing I'm procrastinating on each day." One category of email is tasks which I don’t know what to do about now, but will know what to do about in the future. I use Boomerang (on desktop) and FollowUpThen (on mobile) to schedule those emails to reappear when I am able to deal with them. (Google’s Inbox has this feature, as well.) Fair warning: this power is easy to abuse. Perhaps too-sharp tools to defer making a decision on an email until a later date. [Update, June 2016] I’ve had great success with a Beeminder goal to limit the age of the oldest message in my inbox. If I let a message sit in my inbox for more than 7 days, Beeminder will charge me money. This effectively means that every message has an expiration date. I don’t necessarily need to respond to each email before it expires, but I do need to decide what action to take (even if it’s “don’t respond”) and remove it from my inbox. Using monetary incentives to keep the age of the oldest message in my inbox below 24, then 14, then 7 days. Set a Gmail filter to automatically archive an email as soon as it is marked as read. This forces an immediate decision since you only get one chance to view an email before it disappears from your inbox. Implement Tony Hsieh’s “Yesterbox” system, which involves filtering today’s emails out of your inbox view. This way, when you treat your inbox as a to-do list, you focus on a bounded set of tasks (yesterday’s inbox, hence “Yesterbox”), and avoid the distracting and discouraging accumulation of new emails as you address the old ones. What works for me may not work for you. Each person must find their own unique blend of self-trickery to counteract negative habits like email addiction and procrastination. Since it is technology that created my problem, my first inclination is to use technology to reverse it. These are my initial adjustments. In addition to changing one’s environment and counteracting one’s triggers, though, making peace with email requires an even more personal process of cultivating attention. The 300,000 Google results for “inbox zero” almost all describe systems of mental discipline to maintain control over one’s attention. I’m now more aware of the power of email to leech my attention, and I have an initial cocktail of countermeasures to weaken that power. But that’s the easy part. Remaining mindful of how I want to spend my time and attention, and keeping it from slipping down yet another abyss, is where the real work starts.